Two expats use humour to capture the Diaspora experience, discovers Matthew Schneeberger. Over-the-top weddings. 4.0 GPAs. Lotas in the bathrooms. Spelling Bee champions. Engineers, doctors. 'Model minority' status. The South Asian community in America has its share of idiosyncrasies. Although the site has been live less than three months (it launched June 15th), it has attracted users from 130 countries and has received over 5 million hits. According to Ahmed, mylifeisdesi.com gets about 40,000 page impressions a day and users spend an average of 7 minutes on the site. Good numbers for a two-person start-up. Briefly put, MyLifeIsDesi is a blog that encourages users to send in pithy anecdotes that describe 'how desi' their lives can be. The kicker is that the story must end in the four letter 'MLID' -- 'My Life is Desi'. The site collects these submissions, which have a 300 character limit (about 70 words), reviews them, then organises and publishes those that make the cut. They are placed in one of seven categories: Academics, Cheapness, Dads/Uncles, Everyday Desi, Household, Moms/Aunties, Random, Rishtas. "We disapprove some of the stories if they are inappropriate, unoriginal, repetitive, or offensive. We look at the submitted stories and see how original and humorous they are. Immediately, if the story makes us laugh, we approve it. However, we also consider if others might find it funny and creative," Ahmed explains. Once a new story is up on the main page, the mylifeisdesi.com community votes on how essentially desi the anecdote is by pressing the 'Wah, how desi yaar!' button for a thumbs up and the 'Sorry, not desi enough, umreekhan' button for a thumbs down. The best anecdotes are called 'Funtastic Ishtories' while poorly received ones are labeled 'Thurd Class Ishtories'. Additionally, users can comment on each post. "My parents never wanted to pay money for Halloween costumes, so for five straight years, I wore a lehenga choli and was an "Indian princess" for Halloween. MLID"
"Today, I was at the airport catching a flight. I guess I was the only person with 42 people to wish me goodbye -- with huge banners saying "We'll miss you chooto!" I'm 28, and will be back in 2 weeks. MLID"
"Today I opened my fridge at home and saw a dozen large yogurt containers. None of them contained yogurt. MLID"
Some of the posts receive thousands and thousands of votes, and become the topic of hot debate for the mylifeisdesi.com community. "The site gets about an average of 10,000 visitors and 300-500 submissions a day," explains Ahmed. So how did it all come about? 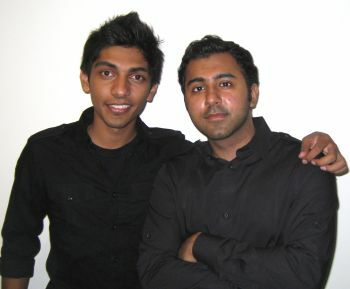 For starters, Memon and Ahmed are about as stereotypically desi as they come, and proud of it. Bilal, now 20 years old, was born in Staten Island, New York, but moved to Piscataway, New Jersey when he was five years old, where he has lived with his family ever since. He's currently a junior in the undergraduate NYU Business School, majoring in International Business and Finance. Usman, now 19 years old, was born in Riyadh, Saudi Arabia, and lived there for 12 years. He moved to the United States 7 years ago and has been living in Piscataway ever since. He's a sophomore at Rutgers University, undergraduate majoring in Finance and Mathematics. He's also the New Jersey State President for an organization called Future Business Leaders of America -- Phi Beta Lambda. One day the friends were reflecting on how unique the lives of desis in America are. They talked about how weddings and parties are so different than those of non-desis. They discussed how desi parents are always focused on their children's marriages and academics, and how desis are notoriously tight-fisted. Suddenly, it came to them: An Internet resource where desis could dissect, analyse and laugh at their own unique, shared background. Ahmed describes it like this: "We realised that there wasn't a site or any other popular source that would express these points of views and share them with others, or a place where others could go and find out they are not alone when it comes to these things. We decided to gain more perspective about how desis view life in general, and the only way we could get information was through the experiences of other desis. Besides learning more about desis and sharing how alike they are in terms of their views, everybody gets a kick out of it. That was our goal. To educate and display humour." About the categories, he explains that they came up with a list of generalisations. From personal experiences, they noticed that desis are strict about grades, focus on early marriage, becoming a doctor or an engineer etc. "Using our instincts as well as suggestions from our members, we came up with the current categories," Ahmed adds. So whereas similar humor blogs like fmylife.com and textsfromlastnight.com caught mainstream attention by appealing to wide target audiences, Bilal and Usman created their site with a specific demographic in mind. Thanks to the power of social networking done via word of mouth and on the Internet, the initial response was overwhelming, says Ahmed. College-aged desis continue to flock to the site in droves. "It definitely is exciting. We understand that there will always be competition, but it's exciting to know people like the concept, and it just makes us work harder and put more effort in to please our fans," he explains. Already the site has had a T-shirt contest and plans to begin selling other merchandise soon. In the long run, the co-founders "definitely" want to expand and diversify on the MyLifeIsDesi concept, so that the site is not just about humorous anecdotes. When asked what he hopes to achieve with MyLifeIsDesi, Ahmed replies: "Unity. What I mean by unity is that we hope to bring Indians, Pakistanis, Bangladeshis and other desis together. Surprisingly, we have seen very (few) racist remarks amongst our fans. Originally, we were shocked. But from the responses on our web site, we realised how similar (desis) are no matter where we come from. Our parents are still going to try to get us married at an early age. They will still scold us for not being the best in school or the best in anything, no matter if you are Pakistani, Indian, Bangladeshi, Sri Lankan etc." When asked what they plan to do in the future, Memom and Ahmed respond in authentic desi fashion. "My future goal is to eventually join the family business and help it expand, ultimately being an independent entrepreneur. Also, I would like to start up a non-profit organisation to give back to society because I think that it's is important for our generation to understand the value of community and charity, and helping the less fortunate," says Memon. "My parents moved out here for me, and I want to show them that they made a good choice. I hope to become an entrepreneur and hopefully give back to the community with the same reasoning my parents had in mind for me," says Ahmed. Quintessentially desi ambitions, desi dreams -- because for Bilal Memon and Usman Ahmed, their lives are desi.